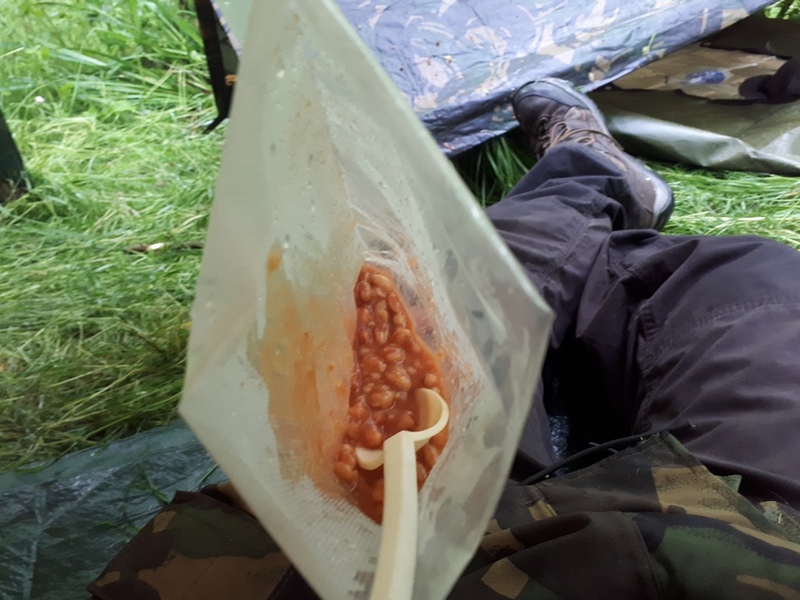 I'd been on about going wild camping with a friend for ages. The idea being that we were only aloud to bring one bag of kit in, just what we could carry in one go. 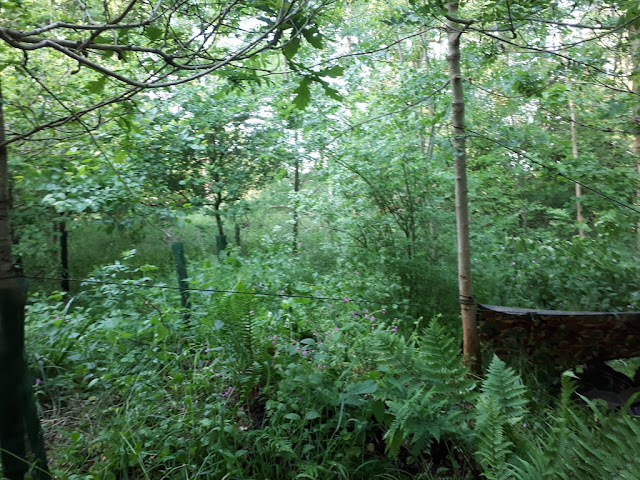 We camped the wood near to where I grew up and this time of year it's thick with undergrowth. The wood is quite well managed and there is a selection of older and younger trees there, so we managed to find a patch of tree that were probably 15 to 20 years old to camp under, with no big ones too near that could drop branches in a storm! We both had similar set up for our sleeping arrangements. 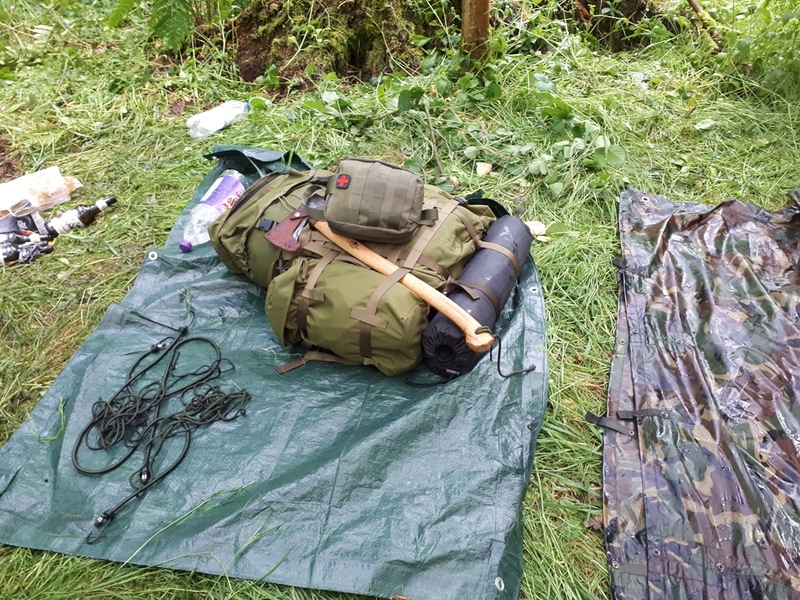 A basha and a bivi bag, it's about as light weight as you can go. As my friend is ex forces it was also good to see how he set his up. 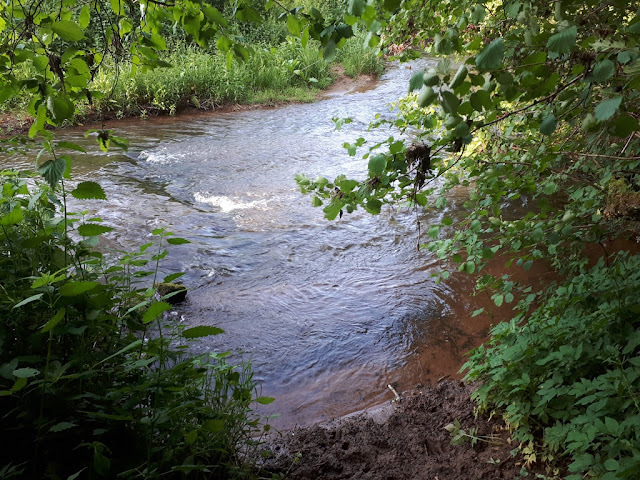 From about 15ft away from our camp you'd struggled to spot it! Shelters sorted we set about collecting firewood for cooking and heat later. 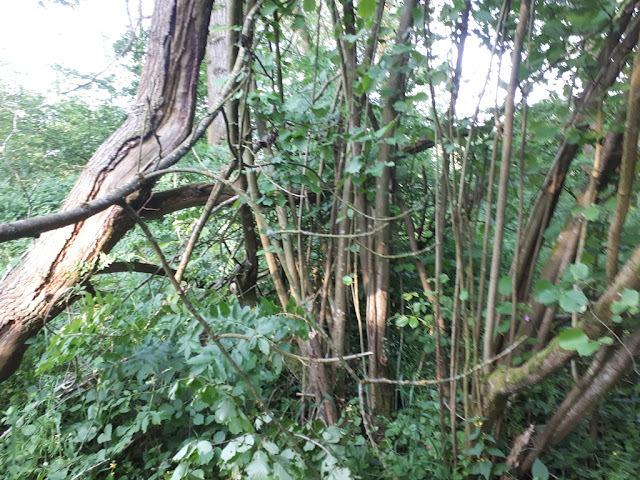 Plenty of standing dead wood in old hazel stands, so we didn't have to go far or work very hard for it. Because we were trying to go as light weight as possible we didn't carry much water. Instead we tested out filters with river water, To be honest it felt a bit odd drinking water from the river but it tasted good! 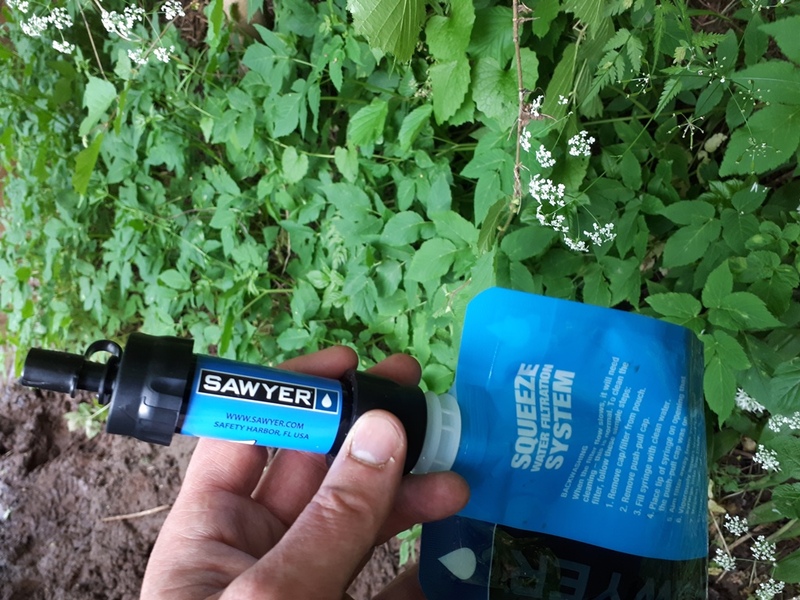 The filter was easy to use but the flow rate was slow, I might do a full review of it at a later date. Pretty amazing to be able to safely drink river water though, and such small size and weight as well. Our food was far from fancy! To cook we (well I didn't) dug a small fire pit, this means that the wind didn't affect it but also we could put the soil back in the morning and leave no trace of where we'd been. 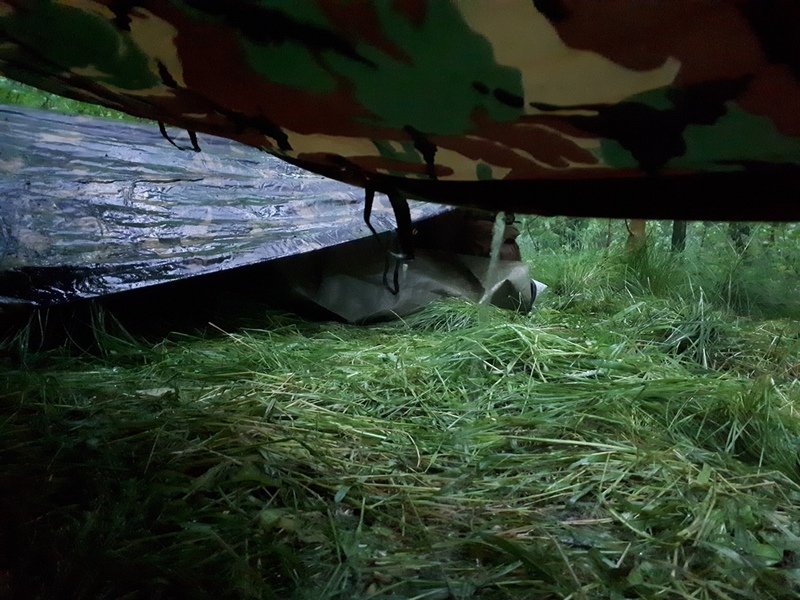 As we knew we were due some bad weather in the night (there were weather warnings online), we both dropped the lines on our basha's before going to bed, making it easier for the rain to run off and offering a bit more shelter from the wind. I woke up at around 2 in the morning to the sound of a huge thunder storm. And I mean HUGE! There was no way I could sleep through it, the sky was lit up like strobe lighting at times and rolls of thunder could be heard for miles around. There seemed to be no end to it and it raged on for hours, after about half and hour the heavens opened and really heavy rain hit as well. Both of us stayed dry though so our set ups worked well. I was surprised how safe I felt in the woods during that storm. In part due to where we camped, far better not to have big trees directly above us (although plenty could have fell on us! ), but it felt sheltered and my thinking was there were many trees taller than us that would get hit by lightening first! I really enjoyed the storm, I found it exciting and I'd never been in the middle of wood during a thunderstorm before, seeing it all lit up like that and the rain hammering down from the comfort of my little shelter was amazing. The next morning we were greeted by rain and a much smaller storm in the distance. 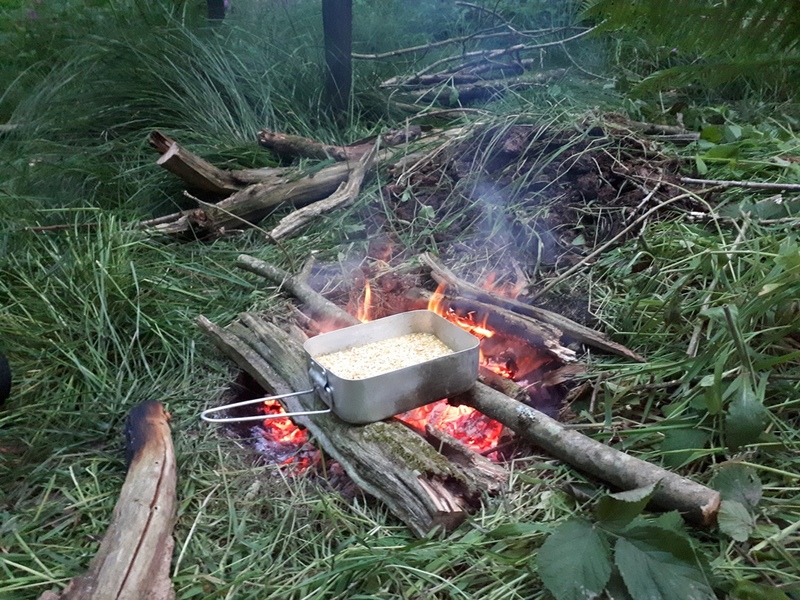 We use the camping stove to heat up some breakfast. 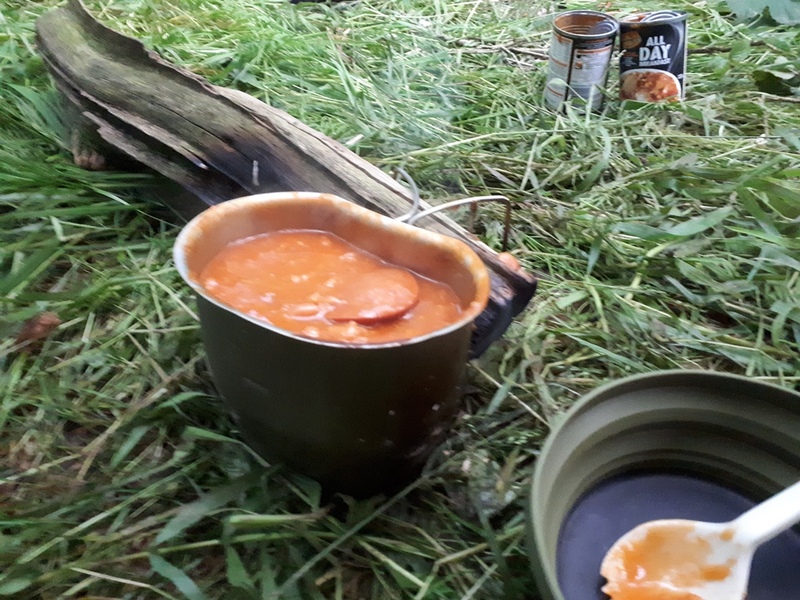 We even tried my dehydrated baked beans - but more on those in another post! Both of us were dry and it took very little time to strip the camp down and walk back out. In all it was an amazing nights camping, the storm really made it for me. Also great to spend a bit of time with a mate, in the woods, practicing some bushcraft and learning some new skills. It also showed us a fair few things about our kit and where we need to improve - if were walking any great distance it would want to be far lighter! Anyone else been "wild" camping lately? Ever been in the woods or forest during a huge thunderstorm? It was great fun and exciting with the storm! A Wood in a storm sounds.......... er.......fun? I'm sure you would have love it sue! It was certainly an experience! Bit of an experience there. My hubby took our two lads out for the night last summer to the field we own. 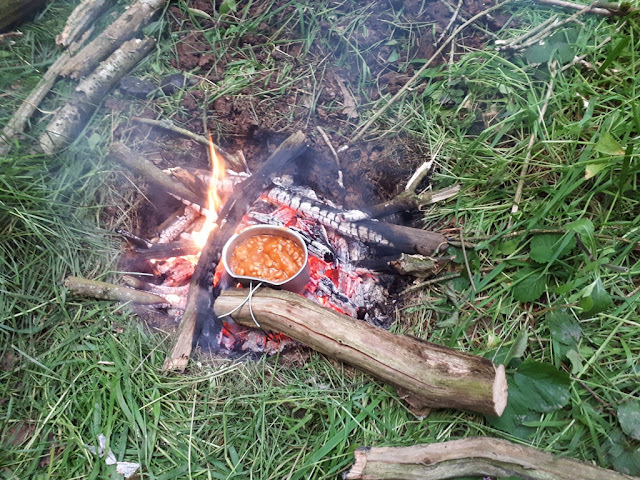 Not as wild an experience as yours but I think they enjoyed it, especially cooking tea and breakfast over a fire. Yeah, I think my eldest is ready for this sort of camping now. Need to buy her a bivi bag she can use! All children love anything to do with cooking on fire! Most adults do as well! I was once caught in the woods when a thunder storm started. I ran for shelter in an old stone barn and found a Pine Marten rushing around trying to catch a flying Bat. It made my day. That's certainly something you don't see everyday! I had a mouse get into my bag about 4 in the morning and woke me up. I didn't eat the cookies that were in there afterwards! What an experience. The energy of a thunder storm is magnificent when you are not protected by the walls of a building and you are outside enjoying the spectacle. 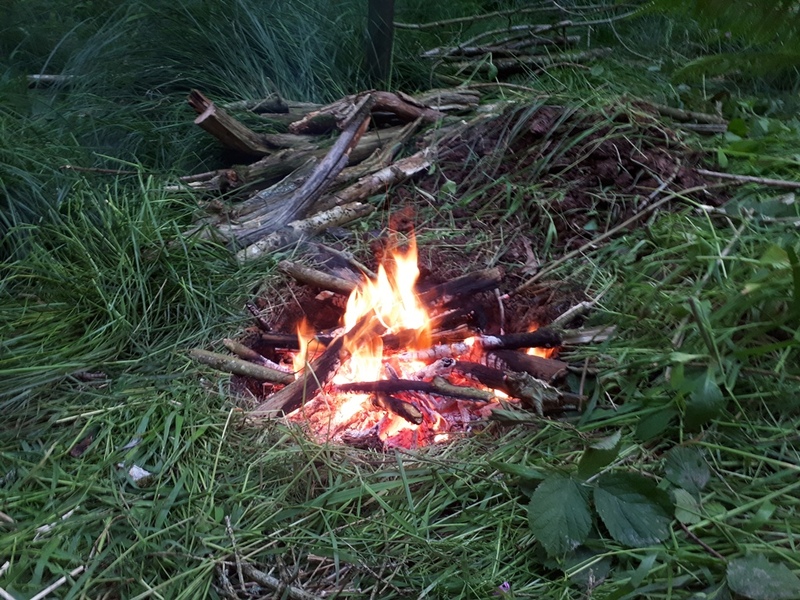 I have never been wild camping but have had a lot of camping experience, all of which was been done with minimal equipment, my best memory being of camping out on a seashore in the middle of winter! No trees around to provide fire wood, so no fire could we build, so we huddled together to keep warm. It was fun! well that sure looks like it was fun. a bit too wild for me though! More wild camping is on the to-do list. My husband is keen to sleep on the top of a mountain after reaching the summit of one when he was younger and finding overnight campers cooking bacon and eggs when he got there! We were camping on a wooded campsite in central France when the children were a bit younger (probably 9-14ish) when there was the most almighty thunderstorm with massive hailstones. 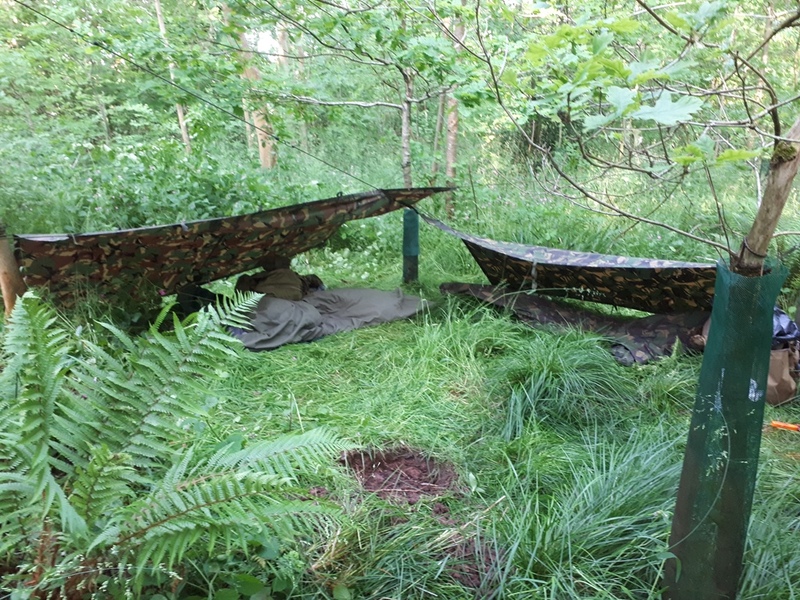 It was exciting but worrying at the time- we were in two 3 man tents under huge oak trees. Actually, it was the best place because the leaves slowed the hail. Our tents were fine but others on the site were ripped. Our car was dented, the kettle still has a war wound and all the caravans had dimpled roofs! We were 6 feet away from the children but couldn't hear even if they shouted, it was so loud. The lightning was spectacular though and the children still talk about 'that' holiday!